An interesting, good-sounding pedal that's ideal for expanding a single-coil-equipped guitar. Broad palette of rich valve boost tones. A tad harsh on high boost settings. The tone control provides an instant supply of increased Fender twang. The Fire Bottle offers many sonic possibilities for the open-minded. Effectrode's pedals are built in the USA, but its 'effects scientist' Phil Taylor is based here in the UK. The company has an ever- growing range of valve-drivenstompboxes, with an emphasis on overdrive, boost and the'classic' range of modulation effects: phase, chorus, tremolo and Univibe-style rotary speaker emulation. "At the maximum gain setting, our shy, retiring amp now barks like an enraged Rottweiler." While previous Effectrode pedals were chunky beasts, this is just slightly larger than your average stompbox. To continue with the valve theme, it uses the 6112 dual triode - a tiny 'subminiature' valve once used as a proximity trigger in WW2 anti-aircraft shells. It also has a rugged, all-steel chassis, with all connections on the rear edge to maximise 'board space. As with all Effectrode pedals, it comes with a 12-volt power supply - because of the voltages required to drive the valves, batteries aren't up to the job. So what is a Magnetic Pickup Booster? Well, the Fire Bottle works on three aspects of your guitar's sound: the resonant frequency, the gain and the tone. The pickup's resonant frequency (and the size of that frequency's peak) plays a major part in creating the trademark sound of a guitar: consider the high resonant frequency and high peak on a Strat, compared with the lower frequency and peak on a Les Paul. To adjust the gain and tone, the Fire Bottle has the standard pair of controls. Up to a whopping 30dB of gain is available, and the tone circuit is based on the classic Fender Harvard circuit from the Tweed era. The third element in the Fire Bottle's sound is the Vari-Z resonance switch, designed to work primarily with single-coil pickups. By lowering the resonant frequency by 2-3kHz, this is designed to give more of a 'vintage humbucker' tone. Appropriately starting with a Strat plugged into a squeaky clean Fender amp and initially ignoring the gain knob, we hear a variety of tones just by combining the tone control and vari-z switch. While the latter is purely for thickening the Strat's single-coil tone, the tone control has plenty of scope for adding brightness. This is never a harsh, brittle effect, though - it's like an instantsupply of increased Fender twang! Using the gain control on its own makes the pedal perfect as a simple boost when you just want more of your current sound. At the maximum setting, our shy, retiring amp now barks like an enraged Rottweiler. 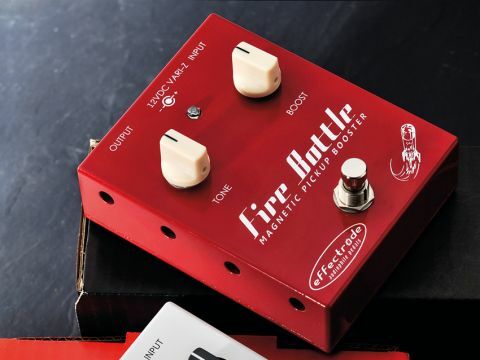 Whether you do this will be down to your personal taste - using the Fire Bottle as the only source of distortion makes for quite a 'scratchy' sound; we prefer a bit of amp crunch to start with. Although no pedal will ever turn a single-coil into a humbucker, you can certainly get some great sounds with the vari-z switch. At quite high gain settings it makes for some lovely thick solo sounds on the bridge pickup, and even some passable jazz tones on the neck pickup with a clean amp sound, cutting the tone on the pedal and adding the vari-z feature. We've never yet been disappointed by the sound quality of an Effectrode pedal, and this one is really excellent. It does require careful tweaking; as we said, using it to provide maximum drive on a clean amp can be a little harsh, so you'd need to consider your precise gain needs and set the various components accordingly. It's not the same as an overdrive pedal, so it takes an open mind to see the possibilities - of which there are many.